Giant Dart is kind of garden game. But it also usually use as indoors and outdoors decoration. If you have idea for having outdoors games, you may use this kind of dart. Take the game of darts outside in to the garden, where you play on a much bigger scale. Create your own role of the game and make the game ineteresting for your children, family and friends. Using this giant darts is fun for all ages. 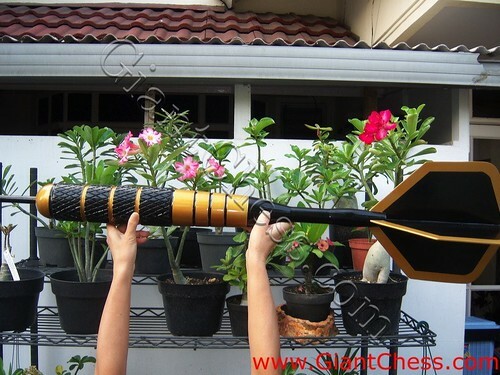 Beside use for some game, giant dart also perfect for indoors and outdoors decoration. You can get idea to decorate your living room or dinning room with this giant dart. This giant dart has made of Teak wood and has carved. It is very unique and perfect for your decoration collection.